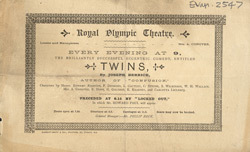 The Olympic Theatre, advertised here, was destroyed by fire on 13 March 1849. A new theatre of the same name was built and opened later the same year, but it was now situated among a large number of slums. In the late 1880s, when the area around London's Strand was redeveloped, the slum housing was demolished along with the three local theatres, including the Olympia. Two new and spectacular theatres, the Waldorf and the Aldwych, took their place.